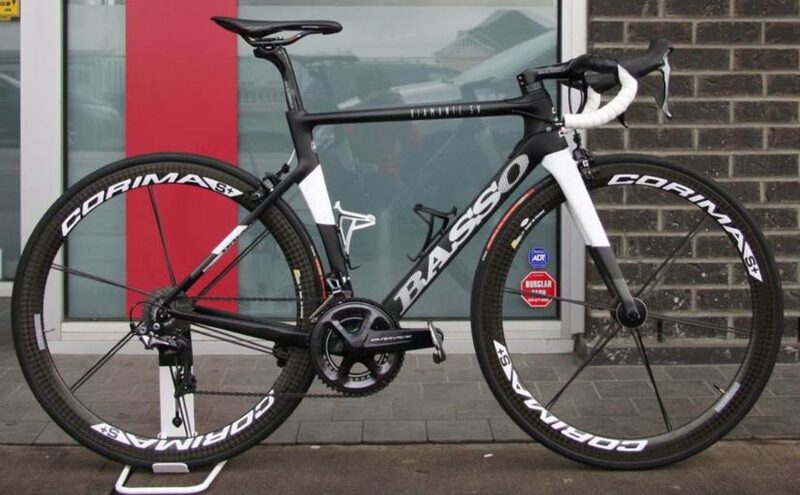 A black and white Basso Diamante SV: Dura-Ace groupset, Corima S+ wheels, 3T handlebar, and Astute Skycarb VT saddle. This bike is assembled by Veloholic Cycles, a local bike shop in Vancouver, Canada. Basso Diamante SV is designed for the aerodynamic position lovers. The air penetration is improved by designing new tube shapes, and reactivity by making a straight blade front fork. The new new system is applied with double pivot brake fixing. The bike introduces the “3B-BASSO” (patented) clamp system. The seat clamping is totally masked and invisible on the frame. Not only nice to look at but also technically innovative.Getting way ahead of the usual clamp-ring/screw holding the seat post, or the extra bulking knot on the frame to house the seat screw; The 3B-BASSO (pat.) triple point fixing becomes a solid structure between seat-post and seat-tube. This system is slim, invisible and strong. In addition to all of this the extra rubber gusset in connection with the 3B-BASSO (pat.) has an anti vibration function which anyone can appreciate on rough surface roads. See more photos on Veleholic Cycles Facebook page. Located in Dueville, Vicenza, Italy, Cicli Basso founded in 1977 by two brothers, Renato Basso (born 1947) and Alcide Basso (born 1954). Their older brother, one of the best sprinters of his generation and 1972 UCI World Champion, Marino Basso (born 1945) lent his experience to the young company which his two younger brothers had just created, after retiring in 1978, when he was 33 year old.